Good morning, those of you who count and even those that don’t. On today’s blog, we’re going to be doing a brief review of an older Marvel related property that many fans might not know about. 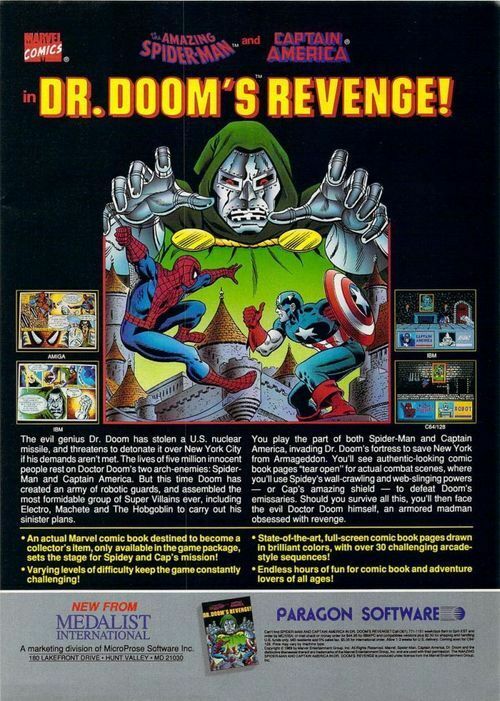 I’m talking about Paragon Software’s late 80s/early 90s foray into Marvel super heroes called Dr. Doom’s Revenge. As a life long Marvel fan, I’ve pretty much played almost all of the early Marvel based video games that a variety of different companies developed during my childhood. Some of them were obvious slam dunks like the X-men and Captain America and Avengers Arcade games, the two X men games released for the Genesis, and the Spider man vs. Kingpin game also released for that same console. These I would consider the pinnacle of Marvel gaming from this era and are games I still play heavily today because they are just so good. Others like Spider man/X-men in Arcade’s Revenge and the Maximum Carnage related beat um’ ups released later, are a mixed bag of good and horrible, for a variety of reasons including repetitive game play, crushing difficulty, or poor controls. Still others like the original X-men and Wolverine games for the NES are so terrible that they are abominations to all gaming and should only be played once or twice just for the experience of playing the dredges of what his subsection of gaming had to offer. Dr. Doom’s Revenge is probably somewhere in that middle grouping of games as it has some really interesting visuals, unique ideas for game play and design, and wants to be very true to the source material. However, upon playing it, it suffers from poor controls and overall execution which makes it a pretty frustrating gaming experience. I remember getting this game when I was in 6th grade for a really old home computer we had that ran off a CGA graphics card. I remember vividly begging my Dad to get it for me as I was absolutely sucked in by the comic book style delivery of the game and the change to play as both Spiderman and Captain America, two of my favorite Marvel heroes at the time, against an impressive list of villains. Those villains included Spidey mainstays like Electro, Hobgoblin, Boomerang, and Rhino but also Cap’s arch enemy Batroc and even a Thor villain in the Grey Gargoyle. The game even came with a comic book that set the stage for the story that you would eventually play. It’s pretty standard superhero fare as Doctor Doom decides to nuke New York City unless he is made master of the world and so Cap enlists Spidey to help him infiltrate Doom’s castle. Unfortunately for the heroes, Doom has enlisted a ton of mercenary type super villains to defend his estate so its a bare knuckled slug fest to fight your way to the iron faced monarch’s front door. All told, that should add up to a terrific game, right? Well, unfortunately, at the time, this old computer that I bought the game for played it really slow and with only 4 color graphics to display what should have been a very colorful game, it was ultimately one of the bigger disappointments of that year for me. And trust me, with all the hormonal early teenage angst issues hitting young Andy at the time, I definitely could have used a game like this to give me something to look forward to. But the game’s potential still stuck with me, and I never forgot about it. So much so, that years later after I found the game among some “Abandoned”ware, I jumped at the opportunity to give it another shot. I mean, I thought that since I now had a computer fast enough to run it and display it in full 16 color graphics (wow!! ), that I could finally enjoy the game the way I should have back in the day. But upon playing it, I discovered it was still pretty flawed and in some ways disappointing. The main issue is the game still has horrible controls making it extremely difficult to battle the endless hordes of baddies they throw at you with any sort of certainty. This coupled with the fact that you only have 1 life for both Wing Head and Web Head with no chance at healing your health bars, and if either one of them die, the game is over, you can see that the deck is somewhat unfairly stacked against you. 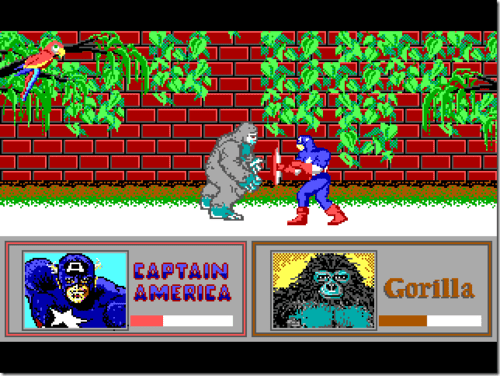 I’ve now played this game several times and the furthest I’ve been able to make it is the above pictured battle between Captain America and a Robotic Gorilla. 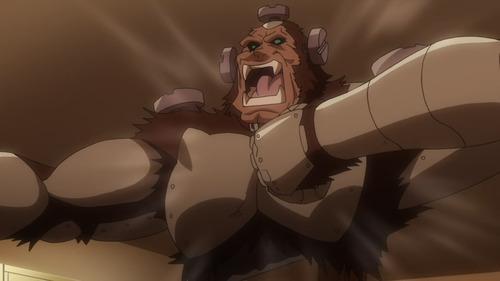 Yes, I said a robotic gorilla. I mean that battle should by definition be awesomely epic. The Star Spangled Avenger in an epic struggle against a evil mechanical monkey. It makes you marvel at the odd ball mindset of Dr. Doom when he not only makes a robot to stop heroes from thwarting his plans but purposely makes it me a 8 foot gorilla. Outrageous! However, due to the poor controls and the Gorilla’s unfair reach, Cap finds himself more often than not falling prey to the evil monkey’s Atomic piledriver move, which drains a big chunk of his life. So although I have managed to beat the Gorilla a couple times, but the end of the battle I’m so beat up that Batroc who you fight immediately, after makes short work of me. And with Cap’s death, as I mentioned before, you don’t even get a chance to continue on with Spidey’s story. The game just ends with a screen shot of New York City being destroyed in a mushroom cloud of atomic death. Again this bugs me to no end, as if you really think about realistically, just because Cap fails at his mission that shouldn’t automatically mean Spider man shouldn’t still have a chance to succeed. Again, poor game design. Nowadays, there would an option to play Cap’s story as Spider man if Cap failed or something, but I can understand the linear limitations in programming for a game close to 25 years old. In any case, I’m still happy that I got to give this game another go and if you are one of these nostalgic nuts like me with some time on your hands I would still recommend that you try it out. You’ll probably have to get a DOSbox or something to play it, but there are a slew of Abandonware websites out there where you might be able to find it (not that promote such things publicly). If you do end up playing it, please drop me a line and let me know if you end up getting further than the evil dynamic duo of Robot Gorilla and Batroc the Leaper. The stuff of nightmares, I tell you what.